Bill Gross talks to Bloomberg TV about bond-market tumult, why China is like "mystery meat" and what could be next for Mohamed El-Erian. 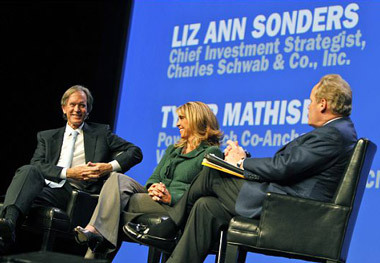 Bill Gross (far left) and Liz Ann Sonders speaking to Tyler Mathisen of CNBC at Schwab Impact. It’s been a tumultuous few months for PIMCO CIO Bill Gross. The PIMCO Total Return Fund, which Gross manages, saw $30.4 billion in outflows in 2013, and Gross’ co-CIO, Mohamed El-Erian, recently announced his resignation. Despite the stock market’s takeoff last year, the new normal that El-Erian predicted is still imminent, Gross told Erik Schatzker and Stephanie Ruhle Tuesday on Bloomberg TV, and investors should lower their expectations and prepare themselves for an era of slow global growth. He also told Bloomberg TV why China is “the mystery meat of emerging market countries” and speculated on what’s next for El-Erian. ERIK SCHATZKER: I think we’ve got to start in the most obvious of places. Why are risk assets correcting? What in your opinion is behind the sell-off? BILL GROSS: Well risk assets, financial systems are unstable with excessive risk taking on one hand and low returns on the other, which in turn encourages more risk taking. It’s sort of like [George] Soros’ reflexivity. Once you get the levered system going, it hardly knows when and where to stop. And so that’s what we’re seeing. We have a highly levered global financial system with hedged positions that are moving back and forth based on emerging market countries and their growth rates or expected growth rates. And when those change, then positions change. And as levered positions change, you’ve got a lot of volatility and reflexivity, as Mr. Soros would have said. STEPHANIE RUHLE: Why aren’t we seeing that kind of volatility in the credit markets? Yesterday Hyundai did an investment-grade deal and it blew out, while I look at equities in emerging markets and they’re suffering. Why is everyone still piling into credit? GROSS: Well credit is higher up on the stability hierarchy I suppose, Stephanie. It – it usually is thought of as a flight to quality, not necessarily corporate bonds or high-yield bonds but Treasury bonds. And when investors want to park money in a supposedly safe haven, and we know that bonds aren’t necessarily safe all the time, they weren’t in 2013, but that’s where money goes. Money comes back to the center, so to speak, of the global financial network. And the center at the moment are one, two, three developed countries. That certainly includes the United States. And so we see treasuries being bought, treasury rates coming down under the assumption that the Federal Reserve will stay put for perhaps a long, long time. SCHATZKER: Bill, what happens next? Would you call this just a bump in the road, or have markets made a detour and we’re going to go down this new road for a while? GROSS: Well I think we will for a while, Erik, meaning for a long, long time. We’ve talked about this with the new normal. The new normal really didn’t apply to the equity market last year, did it? Thirty percent was certainly not normal. But what we see going forward is a global marketplace and a global economy where growth is slow. And to the extent that financial asset prices like stocks and other risk assets have anticipated that growth rate, that’s always a subjective judgement. And it was six to eight weeks ago. To the extent that that growth rate comes down, then risk assets become at risk and more volatility. So I think it’s all dependent upon a growth rate on the global economy. And certainly in the United States we saw some bad numbers over the past few days and we wonder whether or not that 3% growth rate in 2014 is for real. So look at growth and look at inflation, by the way, for an indicator in terms of where the Fed goes. Because as we know, where the Fed goes, where quantitative easing goes and tapering and ultimately the policy rate, which is critical, where that goes is dependent upon not just growth but inflation. And so the inflation target numbers that we see close to 1% are clearly indicative of where bonds might rest and ultimately where stocks might go as well. RUHLE: You’re taking us big picture. Let’s go literal. What are you doing? What did you do yesterday when the market was selling off? GROSS: Well, I continued to buy and PIMCO continues to buy what we think are the safest positions, front-end treasuries, Stephanie, buy four- to five-year treasuries. Do they yield much? No, they don’t yield much. They yield something like 1.25 to 1.5%, but they’re relatively safe as long as the Fed stays put. And we think when Yellen testifies, for instance next week at the joint Congress meeting, that she’ll suggest that for the next two or three years the policy rate will stay at 25 basis points. That means fours and fives basically return with the yield, and that’s an important consideration going forward. If you can hold principal at part and produce some type of return, obviously in this market, in the bond market and in the stock market, if your money doesn’t go down and it appreciates to some extent through interest or dividend payments, then you’ve got a deal relative to what you’ve had for the past month or so. SCHATZKER: Bill, is that to say that nothing else has yet gotten cheap enough to tempt you? GROSS: Well there’s no doubt that emerging markets are getting cheaper. The problem is emerging markets have problems. Take examples such as Brazil and Turkey. These are countries with widening current account deficits. These are countries which by necessity in order to stabilize their currency have to raise interest rates and put their economy at risk in terms of slower growth. So the question becomes whether a 13% three-year rate in Brazil relative to a 10% policy rate is an attractive situation. We think it’s getting there. Brazil is not going anywhere in terms of straight downhill. It’s a country on the move, so to speak, and an important emerging market country, but to a certain extent it’s a fair question as to whether prices have been adequately discounting the slower growth that I speak to. I think we’re beginning to get there. The last wild card, Erik, in terms of emerging market space obviously is China. Is it 6%? Is it 7%? Is it 5%? I call China the mystery meat of emerging market countries. Nobody knows what’s there and there’s a little bit of baloney, so we’re just going to have to wonder going forward through this year as to the potential problems in China and other emerging markets. RUHLE: All right. Mystery meat is disgusting. I remember my high school cafeteria. Tell us what investors are doing in terms of inflows and outflows. They’ve gotten very spoiled in the last couple of years with all the central bank intervention. It’s been very cushy. So this week your phone is ringing and what are they saying? GROSS: Well they’re saying we want safety in principal. This is a Will Rodgers idea, Stephanie, back in the ‘30s. Not so much concerned about the return on my money as the return of my money. What product does that represent in terms of that possibility? Something with a relatively short duration and something with relatively short credit risk or credit spreads. Unconstrained bond funds are one example at PIMCO that are garnering a lot of attention. I’ve been managing that recently, and it’s doing really well. The Total Return Fund is doing really well. It’s up 1.5 to 2% for the month with some good stability and prospects for inflows. So bonds are back. They’re not all the way back, and I doubt they’ll get all the way back to the point of 16, 18 months ago in which interest rates in the 10-year was at 1.65. But bonds have a — have a stable position in almost all portfolios if only for diversification. So unconstrained bond funds, lower duration bond funds, diversified income, equities at some point. At PIMCO, yes, we’re promoting equities as well, and so there’s a place for all of them. One last point, though. I think the era of getting rich quickly is over, and I think, almost, that the era of getting rich slowly is over, too. And so investors should simply bring down their return estimations and prepare for a little bit of volatility going forward. RUHLE: So nobody’s getting rich anymore? GROSS: Well not many. The way to get rich in the past was to borrow money and to lever hedge funds and levered corporate situations in terms of buyouts, et cetera, et cetera, or to buy the stock market in 2013, which itself is a levered type of investment. Corporations borrow 40 to 50% of their balance sheet. They lever up and you can buy equities in a levered type of situation. So leverage over the past 20 to 30 years, Stephanie, has really produced this total return, high-return type of investment market that investors have grown used to. Pension funds think 7, 8, 9% is what they should expect, which means 4% from bonds and 12% from stocks. Not going to happen because basically we’ve been priced into the market. Assets are artificially priced. And from this point forward, double-digit returns, getting rich on leverage, no. You better look elsewhere for — for your profits. SCHATZKER: Bill, emerging market volatility is Mohamed El-Erian’s wheelhouse. Given what we’re seeing playing out now, which I would have to imagine he didn’t exactly anticipate when he announced that he was going to be leaving PIMCO earlier last month, do you think there’s any chance that he might stick around longer than mid-March if this continues? GROSS: I don’t think so. Emerging markets is where Mohamed began, his wheelhouse. He didn’t really invest much money here at PIMCO in emerging markets, I suppose. We were disappointed when he left and surprised? Yeah, I think we were. We still are. He’ll be here until March. But Mohamed came back as not only the heir apparent here at PIMCO but the future CIO. And I thought I fulfilled my job to find my successor at some future point, but obviously not. Where he’s going, where his new wheelhouse will be, he’s told me he doesn’t have a new assignment presently and I believe him. And he’s also said that wherever he goes it won’t be in the financial area. So we’ll have to guess, but I’m sure he’ll surface six to 12 months from now in a — in a policy circle of high esteem. And so he moves on, so do we. RUHLE: Do you think that means Washington, DC? GROSS: Well, it could — it could be Washington. I’m speculating. He hasn’t told anybody, but Washington would be a logical assumption. PIMCO’s — PIMCO’s moving on, though. We’ve got six deputy CIOs with 15 years of average experience, a multitude of manager of the year awards in their respective areas. I think — I think we’re a better company now than we were a month ago, and that’s a big statement. We are the market’s most reliable generator of alpha or what they call outperformance. And I think that’s going to be the case for years to come. I’m really, really looking forward to the next five years. Katie Rass is the managing editor of ThinkAdvisor and the deputy editor of the ALM Media Finance channel. Previously, she was an editor at Dow Jones Newswires, the New York Times News Service and the International New York Times.